Time's Up! now has two bicycle workshop locations! 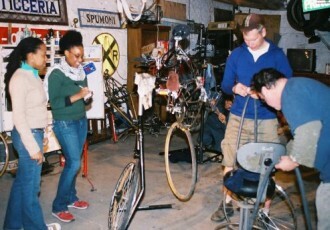 On Tuesday nights in Manhattan we have outdoor bike repair classes which introduce basics of bicycle maintenance. 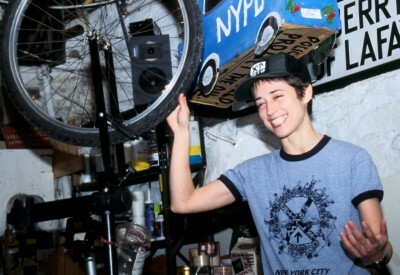 Wednesday (Brooklyn) and Sunday (Brooklyn) nights are open workshops where you can bring your own bicycle and work on it yourself with the aid of Time's Up! mechanics. On Sundays we have classes and then an open workshop in Brooklyn. Time's Up! also runs a recycle a bike program which has recycled 1000's of bicycles and put them back into the hands of new cyclists. We are always ready to accept your donations in the NYC area. 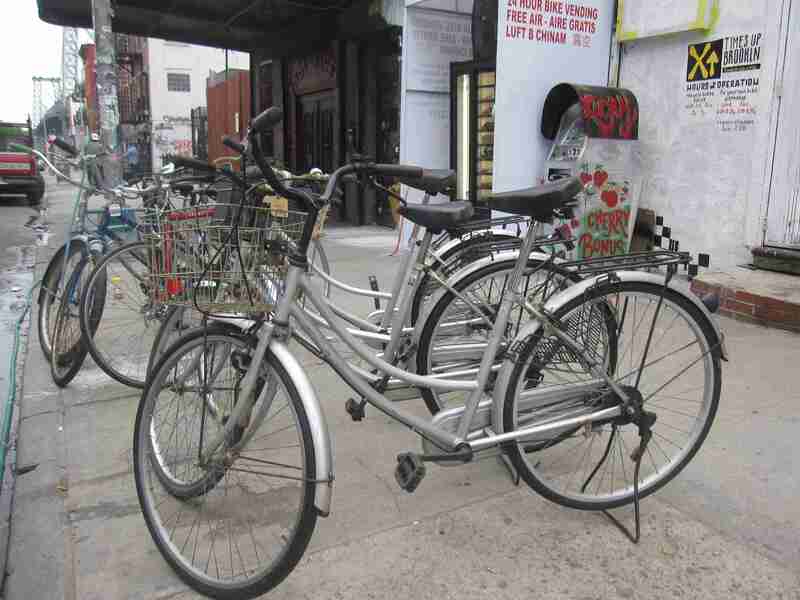 These low cost bicycles can be purchased Wednesday and Sunday after 4 PM the Time's Up! Brooklyn space. Check below for details, locations and hours. Contact our Time's Up! mechanics for any questions regarding workshop schedules, miscellaneous bike repair, donating to our wishlist or becoming a volunteer mechanic at: xupbicyclecoop@gmail.com. The Time's Up! workshops are looking for bicycle repair stands! We need two (2) heavy-duty, collapsible stands to increase the capacity of our weekly workshops. We'd prefer Park brand stands but will take whatever you have. We can provide pick-up and a tax deductible donation form in exchange for your donation. Please email xupbicyclecoop@gmail.com with any bike stands or other supplies (tools, bike lube, cleaning supplies, etc.) you might have laying around! Thank you! 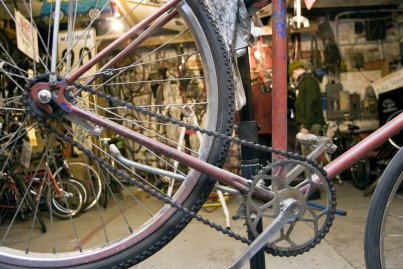 Come learn the basics of bicycle repair from female mechanics at our workshop designed by and for women. You will learn on our bicycles. No previous experience with bicycle repair required. First Week--Basics for Beginners: Identifying parts and tools, diagnosing common problems and things you should know before buying a bike. We will also cover how to change tires and fix flats. Installing, adjusting and tightening derailleur and brake cables. Learn how to fix skipping gears and rubbing brake pads. Third Week--Cups, Cones and Bearings: Overhauling and rebuilding cup and cone bottom brackets, hubs, and headsets. Identifying when problems are present and whether they need a simple adjustment or a more involved overhaul. Fourth Week--Wheels and Spokes: How to true a wheel and replace broken spokes. Every Tuesday night (from April-October) from 7:00pm-8:30pm at La Plaza Community Garden, 9th St and Ave C in Manhattan. Subjects are covered in a four-week rotation beginning the first week of every month. Note that there's no need to do the classes in order, or go to the beginner's class before any others. Classes are free and open to all levels of experience and expertise. 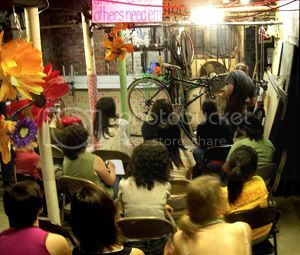 People who want to work on their own bikes and need the help of a mechanic should come to the Open Workshop every Wednesday and Sunday (Brooklyn). Second Week--Cables and Housing: Installing, adjusting and tightening derailleur and brake cables. Learn how to fix skipping gears and rubbing brake pads. Every Sunday and Wednesday from 6:30pm-8pm at our Brooklyn location, 99 South 6th Street. This is an open shop in which you may use our tools and bike stands to work on your bike. Experienced volunteer mechanics will be present to answer any questions you may have, but they will not do the work for you. If you have a big project, please be considerate of the time and plan ahead. No regular schedule for these, but see the Welding Workshop page for more information. Time's Up! is an all-volunteer environmental education and direct action non-profit group. 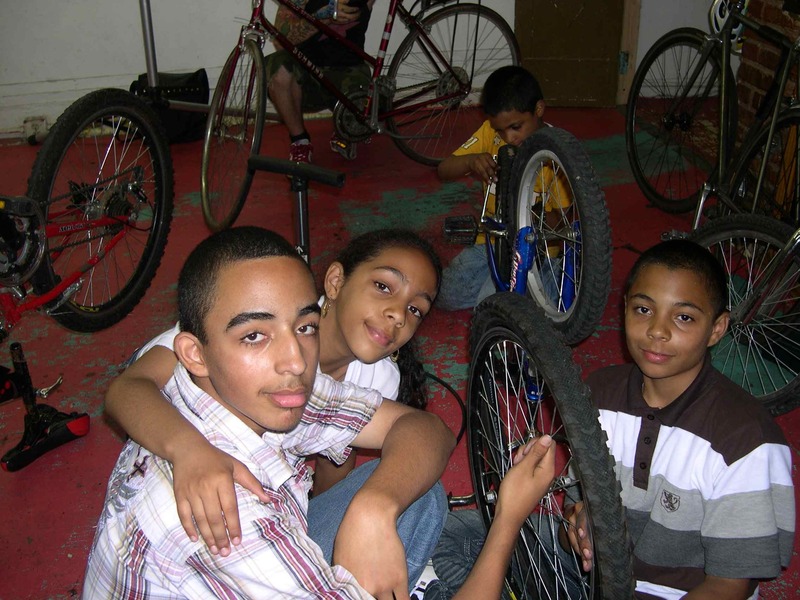 Our Bike Co-op's indoor workshops constitute the educational half of that definition. Our goal is to give everyone enough knowledge to maintain their bikes, and hopefully, teach someone else how to do the same. We hope that by teaching people to fix their own bikes, we will encourage more people to get out there and ride their bikes.There are many ways that you can volunteer and help out Time's Up! 's Bike Co-op. First and foremost, Time's Up! relies on a strong membership base, so if you have not joined already, please do so at our Membership Page. Also, we are starting a program to earn Time's Up! memberships through volunteer hours, if you are unable to make a financial contribution at this time.If you are interested in becoming a mechanic, or in helping out with bicycle repair at the weekly workshops, e-mail xupbicyclecoop@gmail.com or drop by the Manhattan space (156 Rivington St) on Thursday nights. We'll pair you with a current mechanic so you can learn the ropes of the space and gain hands-on maintenance skills.If you cannot schedule a specific time for a committed volunteership, you can volunteer on an impromptu basis. The Co-op always needs cleaning, parts sorting and general space organization.We like to work with our volunteers to figure out what skills will best help the Co-op. Some non-mechanic things that need doing include bookkeeping, writing e-mails and maintaining membership lists. 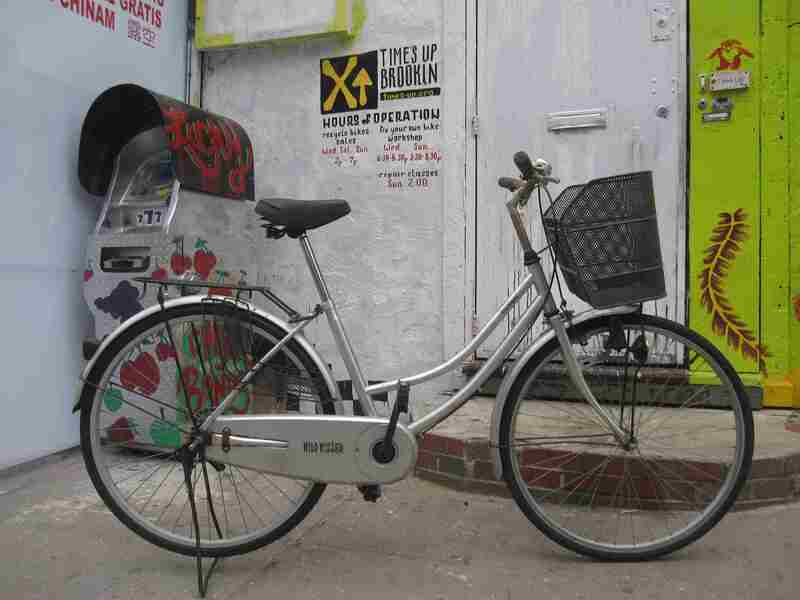 If you are interested in volunteering for the co-op as a non-mechanic, email xupbicyclecoop@gmail.com.If you are interested in helping out at one of Time's Up! 's group rides or other outdoor activities, e-mail timesup.events@gmail.com. Otherwise, the best thing you can do to help out is show up to the workshops and events regularly. There's always ample opportunity to contribute and make a difference! 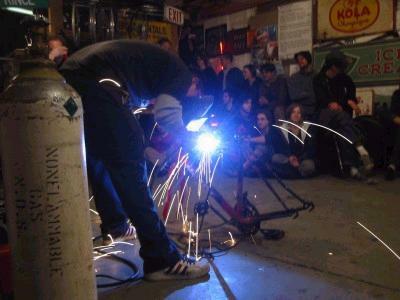 This project is an outgrowth of the Bike National Convention's Bike Workshops in August, 2004. Time's Up! bicycle co-op is now offering inexpensive bicycles from its recycle a bike program.While Time's Up! recycle a bike program offers all different styles of bikes, we are focusing on providing a very practical Dutch style non-gender specific recycled bicycle. This single speed bicycle includes full fenders, both front and rear, full chain guard, and in most cases rear rack baskets, and a kick stand.A kind of bike that will last forever.